Hector B Colado, the son of cigar makers and photographer of the historic 1956 photograph, was born and raised in Tampa. He turned 80 in April 2010, is in good health, and still lives here in South Tampa. Apparently, the amateur photographer took this photograph with his new camera and later placed it with a collection of family photographs, where it was recently rediscovered. 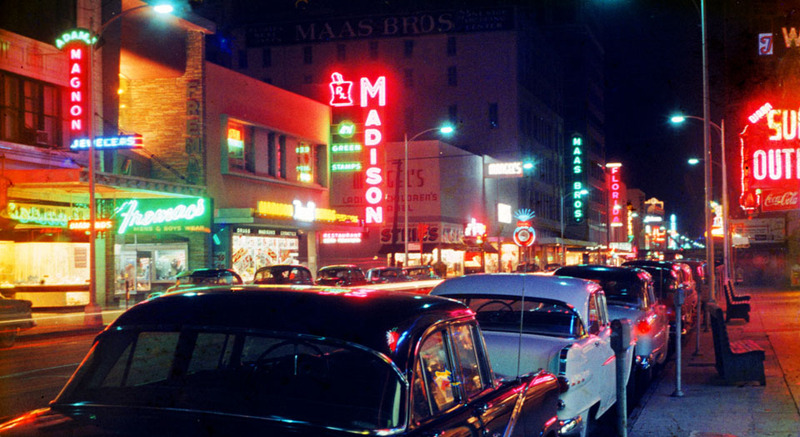 This photograph was recently rediscovered by Hector’s family and is unique in that it shows many of the colorful neon signs on Franklin Street, which are typically shown in black and white in the Burgert Brother’s photographs. Many of the neon signs shown in this photograph, which unfortunately have long been removed, were made by the Cinchett Neon Sign Company. Great job Bryan! This is an extraordinary photo, truly one-of-a-kind. We owe a debt of gratitude to Hector Colado and his daughter Yvonne for sharing this 1950s photo. You can see the same buildings on the left, and if you look carefully, the silhouette of the Tampa Theatre blade sign on the right, at the edge of the Diana Super Outlet sign (red). By the way, this is the 600 block of Franklin St., looking north towards Twiggs St. where the Madison Rexall drugstore sits on the corner. If anyone else has any old personal photographs of street scenes, particularly in color, please let me know. I’d love to re-photograph them! I must correct my comment, it’s the 500 block of Franklin St. looking towards Twiggs. I have a couple of photos of the Brandon area. However, of those photos, only Brandon High School still exists. Please let me know if you happen to have any others of the area. I’d love to try to re-photograph them too! By the way, Mr. Colados color photos are slides. He used color slide film. WOW.. one photo after another shows a vibrant, colorful, people filled downtown. It’s so sad!! What happened?? Sprawl… That’s what happened.. It looks so sad and dreary now as to the late 50’s with all the neon brightening the area. 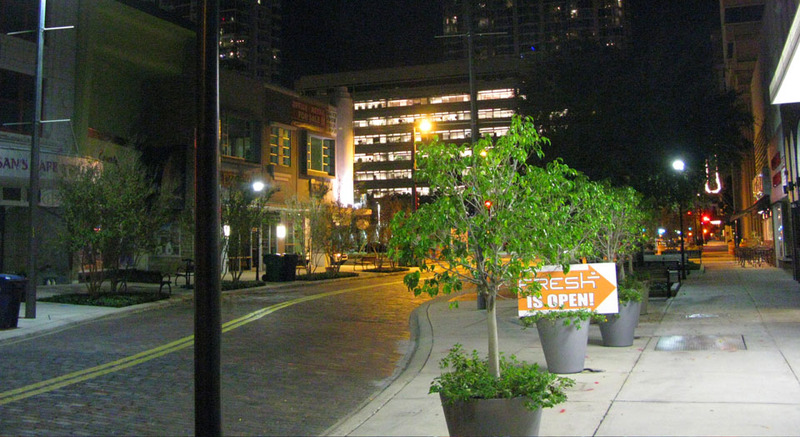 Looks like it could fit right in with New York…….now it looks like, its deserted………..
Maybe one day, as more people more back to downtown, Franklin Street will once again become alive with night life.